...Queen Latifah positioned as a fourth resident, joining the fight to expose the poisoning of Flint over the course of the water crisis. 117 InnovativeHealthMag.com that 90 percent of the Tier I samples are at or below 6 parts per billion (PPB), which is well below the 15 PPB federal action level.” Cher’s original announcement of the film project had garnered a somewhat mixed reception from residents of the city. Some see it as another missed opportunity as it is currently being filmed in Toronto, and the production team and studio have yet to announce any further donations or support towards Flint and its water crisis. In fact, some locals have even stated they would have rather seen the production budget go towards further donations rather than create a film about a town which already has such a negative connotation to it. Others have endorsed the film, hoping that it would attract awareness to other cities that might have the same infrastructure and help prevent them from making the same mistakes that Flint’s city officials had made. 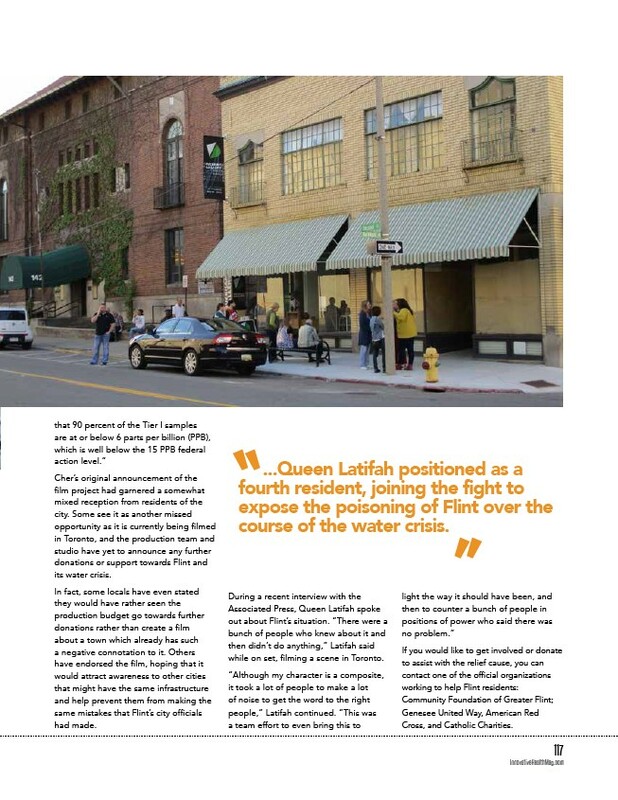 During a recent interview with the Associated Press, Queen Latifah spoke out about Flint’s situation. “There were a bunch of people who knew about it and then didn’t do anything,” Latifah said while on set, filming a scene in Toronto. “Although my character is a composite, it took a lot of people to make a lot of noise to get the word to the right people,” Latifah continued. “This was a team effort to even bring this to light the way it should have been, and then to counter a bunch of people in positions of power who said there was no problem.” If you would like to get involved or donate to assist with the relief cause, you can contact one of the official organizations working to help Flint residents: Community Foundation of Greater Flint; Genesee United Way, American Red Cross, and Catholic Charities.